BBC NEWS | UK | Magazine | What happens to a plane wreck? What happens to a plane wreck? When the investigations on the Heathrow runway are finished, what will happen to the plane wreckage? There are about 143 tonnes of wrecked Boeing 777 lying on and off the runway at Heathrow Airport. Experts from the Air Accidents Investigation Branch (AAIB) are examining the plane and the data recorders to assess what went wrong. When their interim investigation is finished - probably within the next 24 hours - the clear-up will begin so the runway can open as soon as possible. As for the wreckage, there's a range of options. The plane is most likely a write-off, say aviation commentators, although some of its fittings could be re-used, they speculate. Judging by the television pictures, it looks like a wreck, says Mark Knight of AMS Systems Engineering, which supplies aircraft recovery equipment to Heathrow Airport and British Airways. "They will remove it as quickly as possible without much consideration to secondary damage. I don't think it will be put back into service." Had the wings been unscathed and there was a chance the aircraft could fly again, a delicate recovery operation would begin, by lifting the aircraft on airbags, he says. The more likely scenario, he thinks, is the wings will be removed, the fuselage lifted by crane on to a truck and taken away to be stripped. The insurance surveyors will be assessing the damage and making a report, says David Gleave, an independent accident investigator, to decide whether to repair or write it off. "If they scrap it, they will start to look at bits and pieces that they can recover and are of significant value," he says. Horizontal and vertical tail surfaces may not have been damaged and could be kept by Boeing as spare parts. The engines are worth about £10m each, he says, and will probably be sent to an engine repair centre, firstly for accident investigation and then for salvage purposes. The nose cone, weather radar, furnishings and cockpit window could be sold as spare parts if undamaged. "It looks as if all the avionics under the cockpit will be able to be salvaged and all the cockpit instrumentation," says Mr Gleave. "If that can't be sold for spares for operational use it could be sold to a simulator centre who would rebuild the cockpit from there. "There are a lot of parts that could be used again even if they're not put back on to an aeroplane." For instance, a training school could bid for the front section of the fuselage, he says. Planes have been known to return to service after surviving crash landings. In 1999 a Qantas 747 overran the runway at Bangkok in heavy rain and hit a ground radio antennae, but a $100m repair got it back to work. However, the insurer will not allow any components to be re-used unless fully certified and as good as new, says Professor Graham Braithwaite, from Cranfield University, which runs a course in aviation accident investigations. "Seats and furnishing may not be that damaged and may be reusable but airlines will not want customers to feel they are sitting on seats from a crashed plane," he says. "The insurer would be very conscious that it doesn't want these components getting out of a controlled system." Souvenir hunters hoping to pocket a piece of the plane will be disappointed, says Mr Braithwaite. The industry is very strict on provenance and will not want any wreckage to appear on the second-hand market. That means scrap metal from a plane like this cannot just be handed over to a scrap merchant, but has to go to a specialist for disposal. 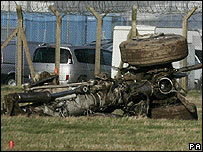 Some aircraft are just too significant to be scrapped, however mangled. Almost 20 years after Pan Am flight 103 was blown up over Lockerbie in Scotland, discussions continue about what will happen to fragments of the plane. The fuselage, about 10 metres tall, is currently held at the AAIB headquarters in Farnborough as evidence in the long-running trial. But with the appeal about to be concluded, there are several interested parties including the Glasgow's Museum of Transport. And while the British Airways plane which crash landed on Thursday, is still largely in one piece, "as far as the integrity of the aircraft is concerned," says aviation expert Chris Yates, "this is an aircraft that will never fly again. Essentially it's a great big lump of scrap metal."